Golden Gate Park is home to an array of trees, plants and flower species that delight visitors year-round because of the glorious weather conditions of San Francisco. From the colorful explosion of tulips in Queen Wilhelmina’s Garden to the poetic spread of plants in Shakespeare Garden, the park is filled with endless nooks and crannies that provide their own unique spray of color and fragrance. Bringing a camera to the park is a must if you want to capture the constant unfolding of beauty. The blooming seasons in Golden Gate Park also play a role in blossoming love, nervous wedding proposals, and providing the ideal backdrop for photography enthusiasts. You may also want to pay a visit to the San Francisco Botanical Garden (located near the corner of Ninth Avenue and Lincoln Way), which offers seasonal plant and flower sales. The floral displays of the Conservatory of Flowers start to bring new life with the seasonal emergence of elaborately-patterned annual blooms. Following a visit to the Conservatory, take a stroll across John F. Kennedy Drive to take in the sights of the Tree Fern Dell and the elusive Lily Pond. Shades of pink will start to dot the park, as magnolias spring into action. Rhododendrons also start to appear in January. The flower beds of the Conservatory offer vibrant colors and will continue to delight throughout spring until late April and sometimes, into early May. Kurume azaleas decorate the Japanese Tea Garden with a striking shade of deep red. In February, an increasing number of rhododendrons are making a grand entrance around this time. Throughout the park, plum trees are flowering. A picnic in March brings you closer to the gorgeous sight of blooming cherry trees, which initially start to flourish in the meadows first. However, it is the cherry trees in the Japanese Tea Garden that demand the most attention from March 15 to April 15. They are in direct competition with the boldness of the Queen Wilhelmina Tulip Garden, which shares the same peak blooming season. The springtime brings flowering shrubs to life throughout the park, including the pleasant scent of the native blue or white Ceanothus (better known as the California lilac). In April, a wave of flower-laden cherry trees continues to adorn the meadows, and the Tulip Garden still brings in the crowds under the windmill located at the west end of Golden Gate Park. Known for their brews and entrees rather than for their charming perennial gardens, the Park and Beach Chalet Restaurants provides a suitable rest stop for butterflies and birds in April. Bring your favorite literary gem to the Shakespeare Garden, where the flowering crab apple trees are sure to provide a cozy reading nook. The beauty of a lakeside walk is intensified with the dusting of golden pollen from the surrounding cypress trees. The Rhododendron Dell also produces noteworthy blooms around this time of the year. A dazzling show of color and fragrance blend to create a dreamy visit to the Rose Garden starting in mid-May. The roses will continue to impress until throughout July. To the east, the redwood grove comes alive with greenery. The Fuchsia Garden is a real treat in May, and will continue to enchant until November. Throughout the park, you will find that various trees and shrubs continue to bloom. 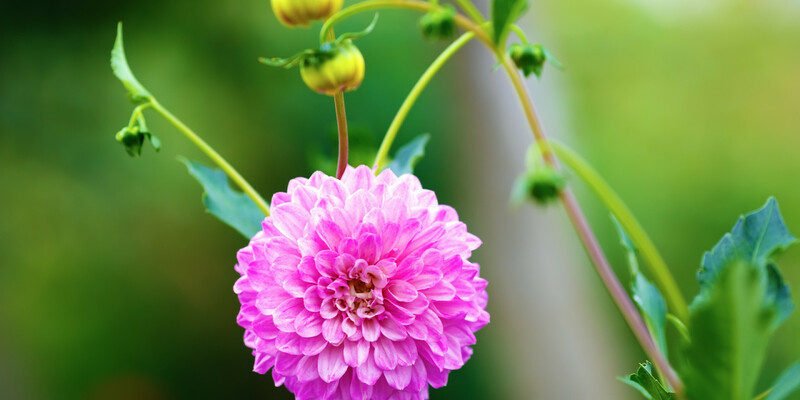 June is the ideal time of the year to visit the brilliant colors of the Dahlia Garden, which lingers on until October. A fresh crop of planted blooms of the Conservatory will start to greet visitors around late June. The Conservatory brings the radiance and cheer of blooms enjoying the peak of the summer season. In July, the park is truly alive with the energy of nature. The combination of gorgeous blooms and the intricate design of flower beds in Conservatory Valley is a remarkable sight to see in August. This month, the Rose Garden provides a wave of fresh flowers, while September also marks the last moments left to enjoy the flower beds at the Conservatory. The Tree Fern Dell close to John F. Kennedy Drive is also home to Crimum lilies this time of the year. As the shades of autumn descend upon the landscape of Golden Gate Park, you will enjoy the orange hue of the maples at the Japanese Tea Garden. A luminous gold covers the park in October, as the resident sycamores start to turn color. Mid-November welcomes the transformation of the Japanese Tea Garden Gingko trees, as they begin to reveal shades of yellow. By December, the rainfall of a San Francisco winter rejuvenates the park. Soon, the golden shades of grass are replaced by the vibrancy of new growth everywhere.